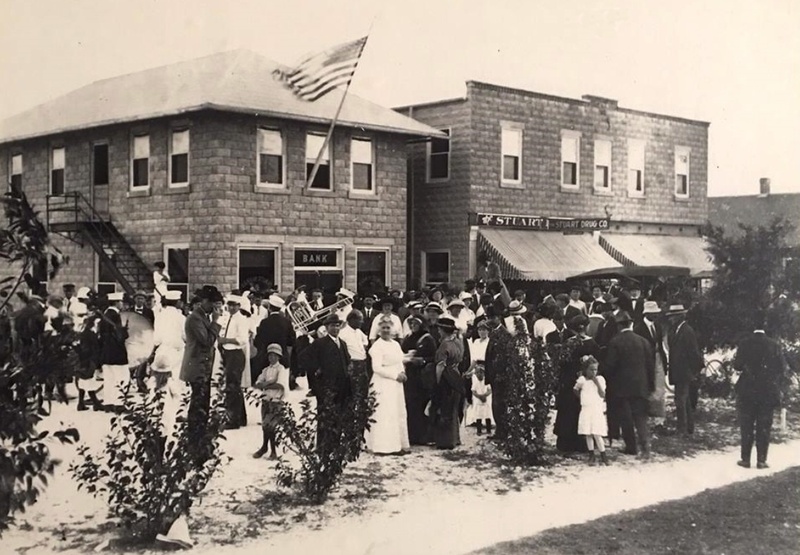 Stuart's community bank, Seacoast Banking Corp., will be celebrating its 90-plus years of traceable history, most of which was in Martin County, dating back to 1933. The world was quite different then as the economic effects of the Great Depression had forced many banking institutions to close. In fact, Stuart had no bank at all for two years prior to the opening of Seacoast's, Citizens Bank, in the Feroe building, at the corner of St. Lucie and Osceola Avenues on February 13, 1933. It has proven to be the most enduring, successful and innovative bank in the community, introducing many modern conveniences to the region's banking public in its 90-year history. Seacoast’s original charter is from 1926 as Indian River County Bank in Sebastian, Florida. This charter was used to open Citizen’s Bank in the city of Okeechobee in 1930. Dennis S. Hudson, Sr., ran a good bank in Okeechobee. During this time, Stuart had three banks that were suffering. Two ended up folding and one just closed its doors. Mr. Hudson was approached to move his bank to Stuart to help its citizens. In 1933, the Citizen’s Bank of Stuart opened its headquarters sharing space with Stuart City Hall and the Police and Fire Departments. With cashier Dennis S. Hudson, Sr., employee Ruth Brooks and assets of about $50,000, it served for years as the only bank between Fort Pierce and West Palm Beach. By the late 1930s, Citizens relocated to a new modern two-story Art Deco building at the corner of Osceola and Belle Flora (Colorado) Avenues. It occupied one of the first major business structures built in town since the Florida land boom in the 1920s, centrally located on the lot, set back off the street, with curved facade and beautiful landscaping on three sides. The bank officially opened January 3, 1939 in the new facility overlooking Haney Circle. Citizens was a community-oriented, friendly bank where in the lobby, Dennis Hudson Sr. usually greeted everyone who entered. As Stuart's only bank in the early '40s during the war, Citizens was a leader in the county for promoting and selling U.S. bonds for that effort and became a member of the Federal Reserve System in 1946. Dennis S. Hudson, Sr., served as the Savings Bond Chairman for Martin County and also served on the board for the Selective Service in World War II. A $30,000 remodeling project in May 1953, included a 12-foot by 85-foot addition on Colorado Avenue. The bank also had the county's first drive-in teller's window, one of the very first drive-ins in the State of Florida, constructed of bullet-proof glass and steel with a microphone connection permitting conversation between the bank employee and customers in their cars. On Sept. 2, 1958, Citizens, previously a state chartered bank, opened for business as a national banking institution called First National Bank of Stuart with a trust department to better serve the community. With the bank's success and a growing customer base, it became evident a larger building with more available property for expansion and customer parking was needed. In August 1959, a 5-acre tract with 175 feet of frontage on Colorado, between Bill Greene Chevrolet Co. and the Shell Service Station, was purchased from Jolly Bozone for a new banking facility. Bozone only wanted one thing in the deal, he asked Hudson, Sr. to pay $15,000 down and to mortgage the remaining $35,000 because he wanted the bank to owe “HIM” money rather than the other way around. In May 1960, another tract of land, bought for $50,000 from Seven-Jem Inc., would provide an additional 250 feet of frontage on U.S. 1, including Bruce & Harry's Restaurant property. On Sept. 4, 1961, Labor Day, the new two-story bank opened to the public for a grand "housewarming" where thousands toured the magnificent facility. Women received orchids and novelty gifts were distributed to all. The concrete framed air-conditioned and heated structure, designed by Stuart architects Armstrong, Pryor and Associates, had glass capable of withstanding 110 mph winds and a massive anodized aluminum gold-finished solar screen. It was built by a firm in Ft. Lauderdale called Caldwell-Scott Engineering & Construction. About a year and a half later, in April 1963, construction began on a concrete and steel triangular pylon, 75 feet in height, symbolic of the space age, which was to be a unique towering sign for the bank near the highway, with large letters, colored lights and a top portion that rotated. First National always strived to be innovative, offering its telephone Time of Day and Temperature service and by introducing the Master Charge credit card to its customers in July 1969, the first bank credit card in the area. The Personal Automatic Teller (PAT) system went into service in November, 1973, permitting customers to get cash 24 hours a day; at the time, no other bank on the east coast of Florida and very few in the country offered such a service. 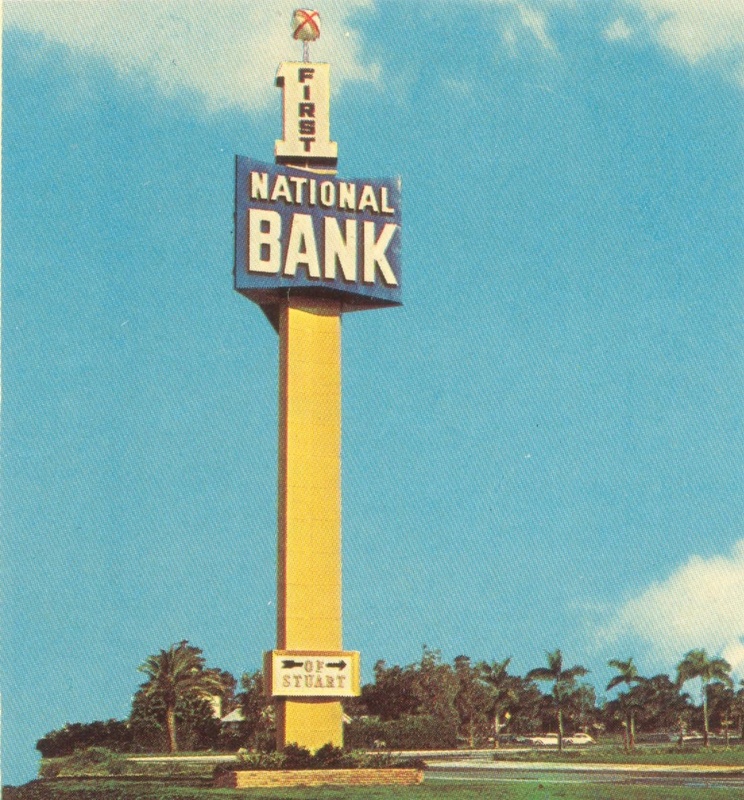 By 1976, assets totaled $100 million and in 1977 Florida banking law changed to allow branching and the first branch office was opened in Jensen Beach. The “Sails in the Wind” logo was adopted in 1981 and electronic banking was initiated in the 1990s. The banking institution which began in Stuart in 1933 as Citizens, a small community bank on the corner of Osceola and St. Lucie Avenues, evolved and in 2017, as Seacoast, operates over 45 branches in 15 Florida counties on the southeast coast, central region and Tampa with more than $5 billion in assets. Dennis S. Hudson, Sr., founding member and past president of Stuart's community oriented bank, died January 16, 1969, but sons, Dennis “Cork” S. Jr., Dale M. and grandson Denny, even great-grandson, Ronnie Houck, all civic leaders in the banking business, have served as executive officers, directors and stockholders in what is Martin County's oldest operating and largest independent bank. Today, Stuart-based Seacoast Banking Corp., the largest and only publicly traded bank headquartered on the Treasure Coast, is one of the largest Florida-based community banks. Research from newspapers, including The Stuart News, The St. Lucie Tribune and Palm Beach Post; personal interviews with Dale M. Hudson and Dennis S. Hudson Jr.; and the Luckhardt Collection of records and photos.